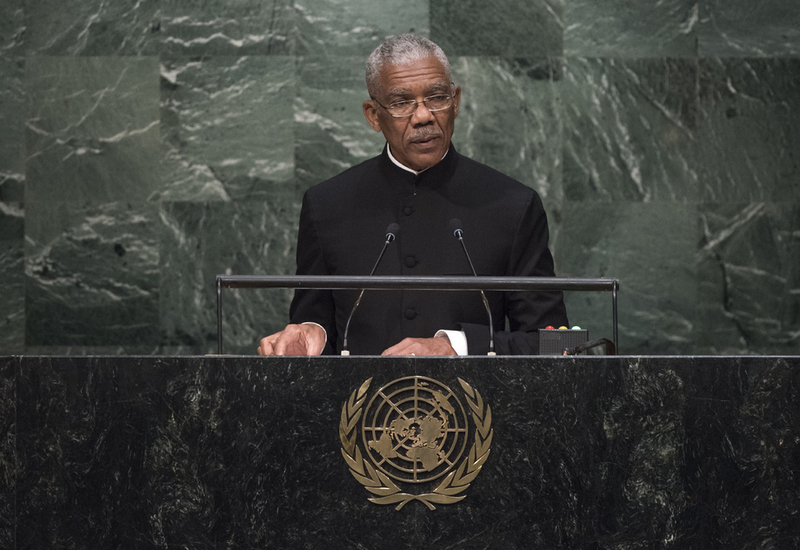 DAVID ARTHUR GRANGER, President of Guyana, said that the membership of the United Nations had quadrupled since it began in 1945 with 51 countries. As undemocratic empires were dismantled, the majority of the new States were mini-, micro- and small States. They asked the Organization how they would be protected from foreign aggression and how their independence would be sustained. Small States risked being subjugated unless the international community demonstrated a commitment to deter dominance by larger, stronger States. Guyana was a small State and a new one, a product of the post-Second World War promise of peace. Indeed, his country was a child of the United Nations. For 50 years, he went on, his country had been prevented from fully exploiting its rich natural resources. Venezuela had threatened and deterred investors and frustrated Guyana’s economic development. The country’s shared borders with Venezuela had been settled 116 years ago, and the whole world recognized them except Venezuela. In 1897, a Treaty of Arbitration had been signed between the United Kingdom and Venezuela and, in 1899, an arbitral tribunal established by that Treaty had given Venezuela 13,000 square kilometres of Guyana’s territory. Venezuela had respected that for the subsequent six decades, but at the onset of Guyana’s independence, it had resorted to various stratagems to deprive Guyana of its territory. With its armed forces 40 times bigger than those of Guyana, Venezuela had pursued a path of intimidation and aggression. Guyana, he continued, was committed to preserving the Caribbean as a zone of peace. With total confidence in international law, his country sought a resolution to the controversy, consistent with the United Nations Charter. Over the past 25 years, the Secretary-General had appointed various good officers to help resolve the issue, but that process had now been exhausted. “We need a permanent solution in order to avoid the fate of perpetual peril,” he said, calling on the Organization to give real meaning to General Assembly resolution 49/31 (1994) by establishing a collective security system, not merely to monitor, but to maintain the security of small States. “The United Nations remains our best hope,” he said.